Dr. Robert Pogue crossed paths with throngs of people who will never forget how he made each and every one of them feel. Many such people came together to honor him on Saturday, July 5th. The 1st Annual Robert M. Pogue, MD Memorial 5K Run/Walk was held under dry skies. A large group of spectators lined the street in front of the Opera House in Raritan to cheer on the over 100 runners and walkers. After the singing of our national anthem and a moment of silence, Silas Pogue and Deb Gillam started the race. The route took participants south of town and then back through various streets and finally to the finish line in front of the Opera House. Matt Butler, Blandinsville, won the race in just over 18 minutes. Theresa Brokaw, Stronghurst, was the first female to cross the finish line in a little over 21 minutes. About an hour after the race started, the last of the participants arrived. 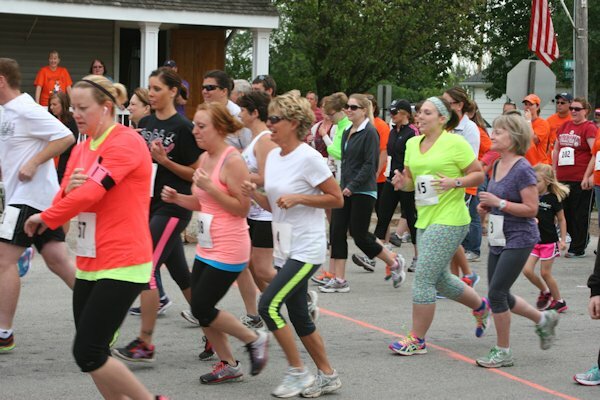 Following the 5K, several young runners took part in their own race consisting of one block. When the running was finished, the aroma of biscuits and gravy and scrambled eggs enticed people into the Opera House for breakfast. The planning committee appreciate the over sixty sponsors and the many volunteers who helped to make this day of honoring Dr. Pogue a success. Proceeds from the event will go toward the Spray Park. As a reminder, brick sales will end on the first day of autumn. Good food, good conversation, and good memories were shared by all present at the 1st Annual Robert M. Pogue, MD Memorial 5K Run/Walk. Looking forward to seeing everyone again next year.